KUALA LUMPUR (Feb 3): Datuk Seri Mukhriz Mahathir was forced to resign as Kedah menteri besar because he lost the majority support of the assemblymen, the Prime Minister’s Office (PMO) said today, amid social media backlash over his ouster. The PMO said there was a lack of confidence in Mukhriz’s leadership as Kedah Umno chief and menteri besar, and his preparation for the 14th general election. “Datuk Seri Mukhriz Mahathir had to resign as Kedah menteri besar because he lost the support of the majority of his state assemblymen. “This was due to a lack of confidence in his leadership, both as menteri besar and state party leader, and concerns that better preparations were needed to retain Kedah in the 14th general election,” PMO said in a statement. It added that Prime Minister Datuk Seri Najib Razak believed Umno and the government had to be disciplined and work “as a united team” to deliver Barisan Nasional’s 13th general election manifesto. It said Umno and Putrajaya must also cooperate to combat the economic and security challenges Malaysia was facing. 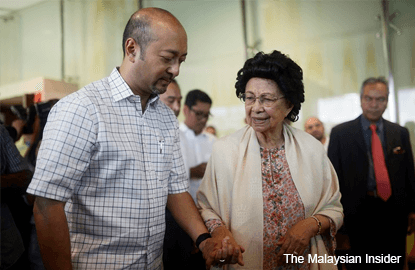 Mukhriz resigned as menteri besar this morning, ending a leadership tussle in the state that began when Kedah Umno declared on Jan 20 they lost confidence in Mukhriz's leadership and wanted Najib to intervene. Mukhriz's resignation prompted social media users to take to Twitter to express their disappointment and sympathy, with many asking when Najib would resign.